Be The Change USA endorses letter to Obama: “Keep it in the ground” | Be The Change U.S.A. The BLM will auction to private fossil fuel corporations more than 90,000 acres of publicly owned oil and gas in central and eastern Colorado, including deposits beneath the Pawnee National Grassland. Despite a worsening climate crisis, the agency authorized the sale. The Center for Biological Diversity and WildEarth Guardians administratively protested the sale (here and here). Today’s letter states that the sale perpetuates a conflict between the Obama administration’s climate goals and its “all of the above” energy policy by leasing federal fossil fuels that should be considered “unburnable” in the context of global carbon budgets. It notes that climate science makes clear that a majority of fossil fuels must be kept in the ground to avoid dangerous warming, and the serious consequences of drought, severe wildfires, extreme weather events and global sea-level rise. Federal fossil fuels — those that the president directly controls — should be the first taken off the table. 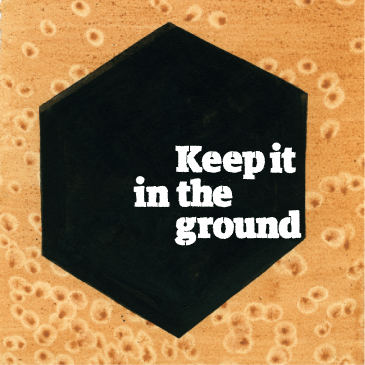 In September more than 400 organizations and leaders working on the “Keep It in the Ground” campaign delivered a letter calling on President Obama to end new federal fossil fuel leasing following reports that doing so would keep up to 450 billion tons of greenhouse gas pollution in the ground, and that the president has the legal authority to do so now, without Congress. Federal oil and gas leasing contributes significantly to U.S. greenhouse gas emissions. Existing federal U.S. oil and gas leases will release 20 billion tons of greenhouse gas pollution; oil and gas containing up to 89 billion tons — the pollution of driving 1.8 billion cars for a decade — have yet to be leased to industry. Some federal leases, including some sold this month, are given to oil companies for as little as $2 per acre. The groups and members of the public will demonstrate outside of the Bureau of Land Management office should the lease sale go forward. This follows a protest of a lease sale in Wyoming last week. More protests are expected for upcoming lease sales in Salt Lake City, Reno and Washington D.C. this fall. Together they make up hundreds of thousands of acres of publicly owned fossil fuels being transferred to corporate control. Groups calling on Obama to withdraw this week’s sale include 350 Colorado, 350.org, Be the Change, Buckeye Forest Council, Center for Biological Diversity, Friends of the Earth, Food & Water Watch, Great Old Broads for Wilderness, Greenpeace, Rainforest Action Network and WildEarth Guardians. To download a copy of today’s letter, click here. Over the past decade, the combustion of federal fossil fuels has resulted in nearly a quarter of all U.S. energy-related emissions. An August report by EcoShift consulting, commissioned by the Center for Biological Diversity and Friends of the Earth, found that remaining federal oil, gas, coal, oil shale and tar sands that has not been leased to industry contains up to 450 billion tons of potential greenhouse gas pollution. As of earlier this year, 67 million acres federal fossil fuel were already leased to industry, an area more than 55 times larger than Grand Canyon National Park containing up to 43 billion tons of potential greenhouse gas pollution. In light of harm to the climate, communities and public lands from federal fossil fuel leasing, more than 400 organizations and leaders in September called on President Obama to end federal fossil fuel leasing. They included: Bill McKibben, Winona LaDuke, Robert F. Kennedy Jr., Dr. Noam Chomsky, Dr. Michael Mann, Tim DeChristopher, Dr. Stuart Pimm, Dr. Michael Soule, United Auto Workers Union, Unitarian Universalist Association, Physicians for Social Responsibility, Protect Our Winters, 350.org, Center for Biological Diversity, Environment America, Friends of the Earth, Food & Water Watch, Indigenous Environmental Network, Oil Change International, Greenpeace, Rainforest Action Network, REDOIL, Sierra Club, Waterkeeper Alliance, WildEarth Guardians and hundreds of others. Last week Senators Jeff Merkley (D-Ore.), Bernie Sanders (D-Vt.), Elizabeth Warren (D-MA), Barbara Boxer (D-CA) and Ben Cardin (D-Md.) announced landmark climate legislation, The Keep It in the Ground Act, that would end new federal fossil fuel leasing on public lands and oceans and prevent the renewal of some existing non-producing leases. Download the September “Keep It in the Ground” letter to Obama here. Download Grounded: The President’s Power to Fight Climate Change, Protect Public Lands by Keeping Publicly Owned Fossil Fuels in the Ground here (this report details the legal authorities with which a president can halt new federal fossil fuel leases).